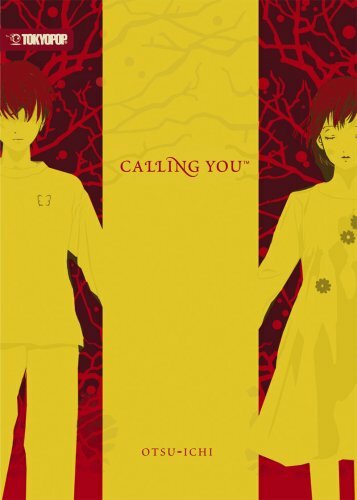 This review is for Calling You, an anthology of three short stories written by Otsu-Ichi (with illustrations by Miyako Hasami). The English edition was released in June 2007 by Tokyopop. This is a light novel that I feel likely went under the radar for most readers, but if you are in the mood for a few heartfelt stories that work with supernatural elements (think along the lines of Natsuyuki Rendezvous), then Calling You is entirely worth checking out. The stories are paced well, translated well, and have some rather beautiful illustrations scattered throughout. The first entry shares the name of the book (Calling You), and tells the story of a friendless high schooler who conjures in her mind a cell phone that would offer her some semblance of a social life. Soon enough, a boy who likewise has an imaginary cell phone randomly gives her a call… and the story goes from there. It’s a clever premise, and I thought the story did well to capture the feelings of isolation that some teens experience. The second story is titled Kids, and deals with two boys who are placed in a class for “special” and “problem” students. One boy’s issue is that he is essentially mute, only speaking on the rarest of occasions–while the viewpoint character simply had a violent outburst one day in reaction to bullying over delicate family issues. The quiet boy turns out to secretly have the power to heal the wounds of others, transferring the pain and scars to his own body. It’s a bittersweet tale, and one I had to read to the end once I started. The third story is called Flower Song, in which the hospitalized protagonist struggles to overcome the loss of a loved one in a train wreck. It’s a story of recovery after tragedy, and in this case the assistance comes in the form of a humming flower that has a girl’s face. I found it a very tender story, and it’s likely my favorite of the three thanks to a reveal at the very end, which caught me completely by surprise. I also appreciated how the story handled depression in general, going into just the right amount of detail to really show how the characters felt through their trials, and how they struggled to overcome their lingering despair. Clocking under 200 pages in all, the three stories make for quick reads. For anyone who likes character drama that deals with real-life issues in unique and engaging ways, Calling You is a great book to pick up.